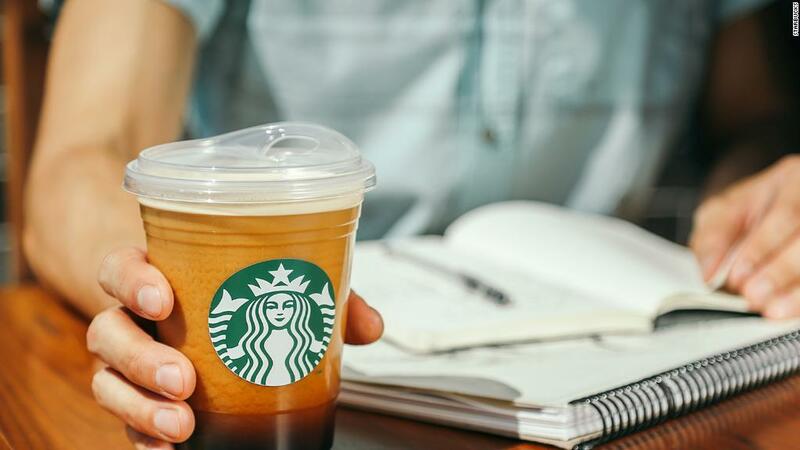 Environmental sustainability is a hot corporate trend right now, with one company after another banning plastic straws, offsetting carbon emissions, and taking other steps toward being better planetary stewards. But even by that measure, WeWork wants to be outstanding in the field. Literally. 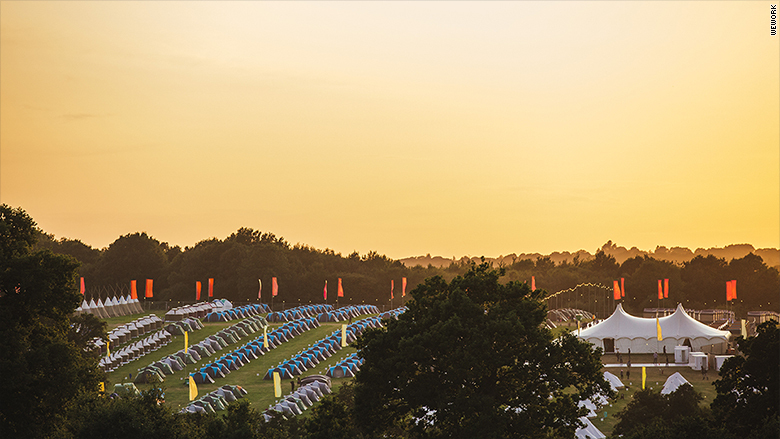 Some 8,000 WeWork employees from around the world descend on a bucolic pasture in England next week for the company's seventh annual summer camp. They'll listen to talks from speakers like entrepreneur and author Tim Ferriss, attend workshops, and participate in activities like stand-up paddleboard, gong therapy, and sound baths. Yes, sound baths. Beyond the corporate teambuilding, WeWork hopes the event provides a model of sustainability that other companies, as well as the entrepreneurs and businesses who use its coworking spaces in 20 countries, will follow. The idea is to get everyone working together to address environmental issues, Lindsay Baker, WeWork's global head of sustainability, told CNNMoney. "The more we scale, the easier it is in some ways to deal with these problems in a comprehensive way," she said. 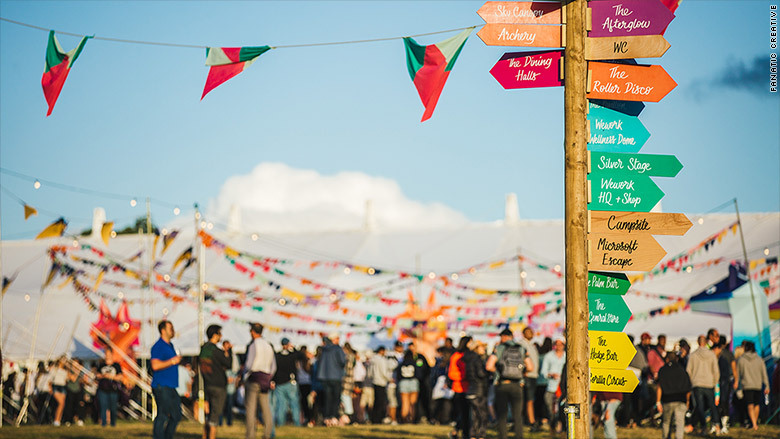 Some 8,000 WeWork employees from around the world descend on a bucolic pasture in England for the company's seventh annual summer camp. The company, believed to be worth $20 billion, makes a point of promoting sustainability. Last month it took the radical step of banning meat at corporate events and refusing to reimburse employees for meals that include red meat, poultry and pork. WeWork wants to achieve carbon-neutrality by 2025, and it works with carbon-offset organizations to mitigate the impact of corporate travel like flying thousands of people to England. Such things are increasingly common in the business world. Hundreds of companies are working toward carbon neutrality, for example, and striving to conserve water and energy on their campuses, said Tensie Whelan, director of the Center for Sustainable Business at the New York University Stern School of Business. Going green, or as green as possible, makes sense from an ecological and business perspective, she said. "The broader gestalt is one that both plays well with the millennials these companies want to attract and is meaningful in terms of supporting better sustainability practices at the office that hopefully employees will carry through at home," she said. WeWork's corporate do-goodism continues at next week's camp, where plastic straws and bottled water are prohibited, plates and flatware are biodegradable, and the goal is to recycle, reuse, or donate as much as possible. Everyone will sip canned water or top off their reusable bottles at refill stations. Anything that isn't recycled will be carted away to a carbon recapture incinerator. Local vendors will provide meat-free meals. The company is working with Eighth Plate to collect and distribute leftover food and Help Refugees to donate anything people leave behind, like clothing. Despite the buzz the meat ban generated, WeWork's commitment to the environment and sustainability goes beyond dictating what employees can't eat on its dime, Baker said. Global environmental impact, as well as employee health and wellbeing, are top priorities, she said. Under Baker's leadership, the company is working with the nonprofit Carbon Fund to minimize its carbon footprint. WeWork plans to invest in the Envira Amazonia Project the Brazilian state of Acre to offset the impact of flying everyone to summer camp and mitigate other corporate travel. Andrew J. Hoffman, professor of sustainable enterprise at University of Michigan's Ross School of Business, said flying and eating meat are two of the biggest contributors to a person's carbon footprint. But he believes carbon offsetting should be a lower priority for companies than banning meat or plastic, which have a far greater impact. A 2016 report from Öko-Institut, a European nonprofit group that studies environmental issues, found that 85% of the carbon offset projects it looked at were not providing additional reductions in emissions. Still, Hoffman said promoting sustainability and making employees aware of things like how abstaining from meat can curb CO2 emissions is "an admirable step to take." And the way Baker sees it, every little bit helps. "We are thinking about global and social impacts -- what's going on in the world and what are issues we can help tackle?" she said. "It's a very different frame when you start from that angle, rather than saying whats our impact on the world and how to do we neutralize that." Baker is already looking ahead to next year's camp, and what more she can do. She'd like to start by analyzing exactly how much waste the company generates, so she can track its reduction over time. And she's already got another idea for making the company a little greener. "Biodegradable water bottles," she said. "We'll try to do that next year."